Sorry this class has been canceled! 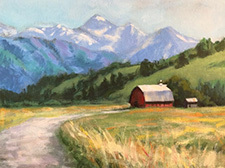 Learn the basic techniques for creating an acrylic landscape with step-by-step demonstrations. Discover how to create interesting compositions, when to use hard and soft edges, and how to make all the variations of green in a landscape work cohesively. All levels are welcome!